A former Conducting Fellow with the Seattle Symphony, Ruth Reinhardt leads music by Beethoven, Tchaikovsky and Kaija Saariaho on October 18–20. German conductor Ruth Reinhardt is a rising star in the orchestral world — and she’s not touching down anytime soon. Ruth spent the past two years as Assistant Conductor of the Dallas Symphony Orchestra and just finished a season-long fellowship with Gustavo Dudamel and the Los Angeles Philharmonic. But before all that she was a Conducting Fellow with the Seattle Symphony. Ruth earned a master’s degree in conducting from The Juilliard School where she studied with Alan Gilbert, then joined the Seattle Symphony’s conducting staff for the 2015–2016 season. She has returned to Seattle as a guest conductor every year since. 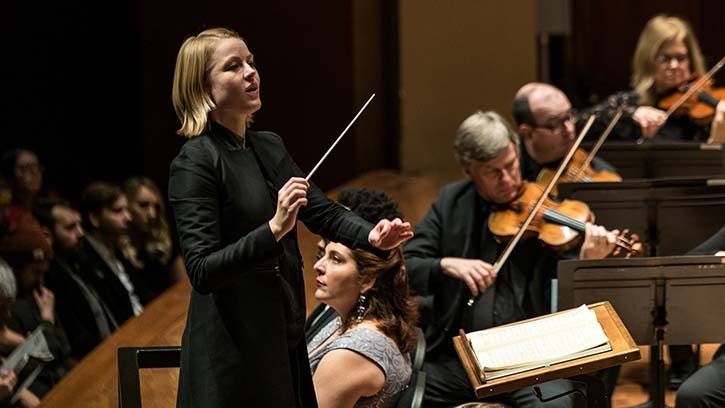 Last season she led the Seattle Symphony’s annual performances of Handel’s Messiah and is back this month to conduct works by Beethoven and Kaija Saariaho, as well as Tchaikovsky’s Rococo Variations with cellist Sheku Kanneh-Mason. We wanted to know more about Ruth as a conductor and person. Here’s what we found out! I started playing the violin when I was 6, mostly because my older sister played violin and I wanted to do everything she did! Though I really fell in love with music when I joined the children’s choir at the opera and got to perform Verdi’s Othello about 35 times. Being on stage with those amazing musicians gave me an idea of what music could be, and it totally blew my mind. How did you become a conductor? I conducted for the first time when I was 15, totally by chance. I was in France that summer playing oboe in a youth orchestra and the conductor (mostly joking) asked after rehearsal if I wanted to conduct. I thought, “Why not? It might come in handy if I want to perform my compositions someday.” So the next morning I conducted Schubert 6! I had never considered becoming a conductor, but I immediately realized that it combined all the things I pursued separately into one. What things did it combine? I was always fascinated by scores because I wanted to understand how they were made: what else was going on apart from my line and why did a certain moment give me goosebumps? Partly this interested me because I was composing myself. I also played a lot of chamber music. I was in a quartet since I was 12 and it always bothered me when we ended up having four different ideas that were all very good but didn’t fit together. I already believed in the storytelling aspect of music and wanted the overall interpretation to be coherent. I just knew that I had to try to become a conductor no matter what, even though there were few role models for me at that time. What do you love most about conducting now? I love the communication — being part of a live conversation with both the musicians and the audience. I believe conducting should never be a one-way street of me imposing something, but a dialogue. I also still really love to study scores. To try to understand how they are built and how to shape them to tell the story of a piece. Do you have a favorite place to study scores? I enjoy studying outside or in a quiet cafe — sometimes background noise and occasional distraction oddly makes me more concentrated. Stepping in for Stanisław Skrowaczewski with Lutosławski’s Concerto for Orchestra and Brahms’ Fourth Symphony with the Dallas Symphony Orchestra was incredible. I also just got to share a concert at the Lucerne Festival with Sir Simon Rattle and the London Symphony Orchestra, which was really amazing! Any music on your heavy rotation lately? I just came across the jazz singer Cécil McLorin Salvant who I’ve been listening to a lot. Unfortunately I'll just miss her concert in Seattle. Head over to our YouTube channel to watch Ruth Reinhardt lead the Seattle Symphony in Bernstein’s Overture to Candide! Sheku Kanneh-Mason’s performances are generously underwritten by Grant and Dorrit Saviers through the Seattle Symphony’s Guest Artists Circle.